We would like to express our deepest appreciation to our generous individual and corporate sponsors, whose invaluable contributions provide the foundational support for our athletes! At Limitless Ice Skating Academy (LISA), we aim to live up to our name, mission, and values by enabling and supporting our skaters to have a future which is truly Limitless. As a 501(c)(3) nonprofit organization, our programs are designed to train and support skaters in the pursuit of their goals and dreams, including performance and competition on the national and international stage, at the lowest possible cost to skaters and families. Each sponsor of Limitless Ice Skating Academy receives an official sponsorship appreciation letter documenting its contribution, and may be recognized on certain Limitless marketing and promotional materials, including our website and event programs, if they so desire. Donations are tax-deductible, to the extent allowed by law, and can be made via the Paypal link below, by check, credit/debit card, or ACH direct withdrawal. 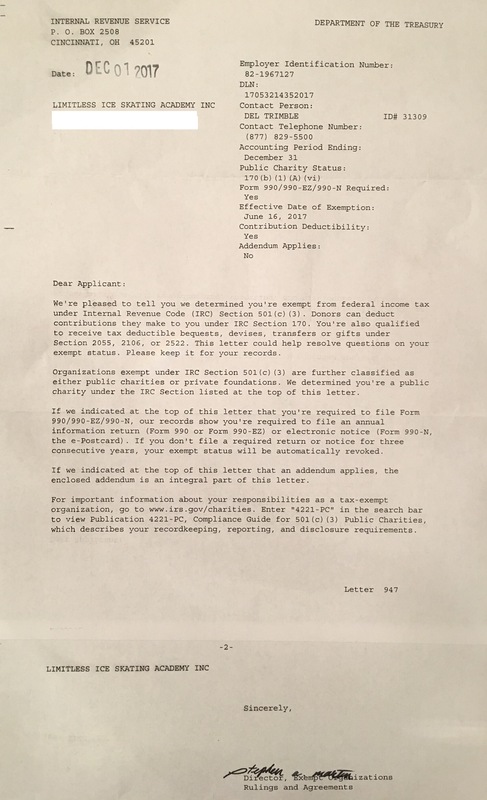 Below is our Letter of Determination from the United States Internal Revenue Service, stating Limitless Ice Skating Academy as exempt from federal tax under Internal Revenue Code (IRC) Section 501(c)(3), as well as our 2017 and 2018 Annual Reports. We extend our heartfelt gratitude to our sponsors, for partnering with us in promoting healthy living and honest, hard-working values, and helping to make dreams come true. Please click the button below to make a donation online. Please fill out the corresponding form for individual and/or corporate sponsorship, and mail it to the address below.